A client of mine who is in a leadership role is trying to implement a new focus in her company and a different way of working–changes which she believes will support her company and their clients. Now it’s just a matter of receiving the support and endorsement of her colleagues for her plan to be successful. What could be the roadblock here? As we talked about how to gain support, she believed that she would not be successful. She was certain that a key person who would need to adapt the plan would simply never agree. It would not be about her idea; she knew that he would thwart the initiative because he did not like her. Fifteen years earlier, my client had worked with this person, and she had never felt included by him. Sour feelings built, and she eventually changed departments to avoid working with him. Meanwhile, he consistently gave her negative reviews on 360 surveys about her leadership abilities and style. My client conceded that she would not be able to win him over. In fact, she had not even actually spoken to him in many years despite their attending many of the same meetings and both being part of the management group. My client is not alone. Often, people dislike others in their organizations and it causes great pain for the people involved and thwarts many positive outcomes. Often, the ill sentiments and behaviors are the result of misunderstandings, miscommunications, insecurities or a feeling of competition. Ideally, it is useful to work on repairing relationships, especially when you are likely to work with the other person in the future. In organizations, people remember conflicts from the past or harbor ill feelings, and this limits them from moving up or forward in their company. In my experience, many people are not promoted simply because someone in senior management recalled an incident that happened years before involving the other person. It can be hard to shake these negative perceptions. 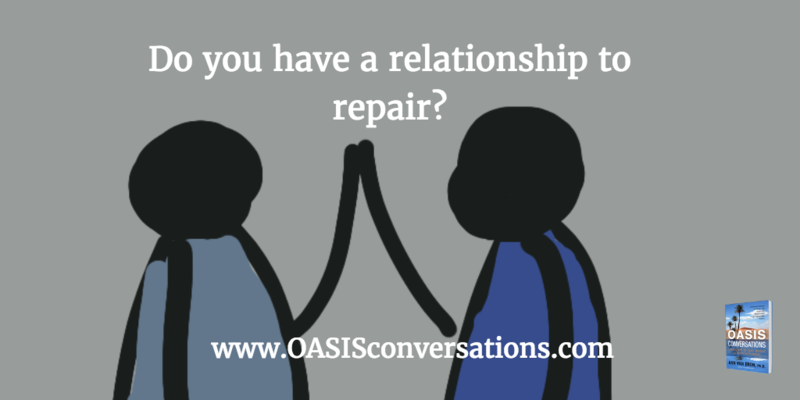 The good news is that if you reach out to repair a relationship it is often possible to do so. My client was able to approach her nemesis and over time began to build trust. She started by receiving some empathy about the pain he caused her from her executive coach and reflecting on her role in their dynamic. She began shifting from seeing him as evil and trying to understand his perspective. She worked on being more open to him. She started to acknowledge some of his statements in group meetings and even appreciating some of his actions. By being more positive and open to him, he started being more open to her. Emotions are contagious and when we change how we see a situation we create space for new possibilities. The result? Her project was endorsed. Who will it be worthwhile for you to bridge a relationship? Start with acknowledging your negative emotions and looking for your contribution to the situation. Work to look for what you can appreciate about the person and shift to being open. Look for opportunities to acknowledge and give empathy to the other person.